What do mycologists think about the tree of life? Capturing information about individual branches, such as support values and branch lengths, is difficult, and in some cases impossible, because the trees were deposited without such information included. It is possible to make decisions about priority on a node-by-node basis, but this requires decision-making by the individual performing the synthesis. Absolutely! In fact, the ongoing 1000 Fungal Genomes Project is already using taxonomy to guide sampling. Open Tree will be able to help in this effort by providing a comprehensive view of phylogenetic diversity of Fungi that will help identify clades that are poorly sampled. We will also be able to prioritize genome-based studies during synthesis, which should allow us to create trees based on a very robust backbone. Numerous talks and posters at MSA concerned fungal phylogenetics and taxonomy. So much progress is being made! For example, there were presentations on systematics of chytrids, downy midlews, rusts, earth tongues, lichens, mushrooms, and many more. At the same time, in the course of developing the first synthetic trees for this project, it has become abundantly clear that the major centralized taxonomic resources, like Global Biodiversity Information Facility (GBIF) and National Center for Biotechnology Information (NCBI) have a hard time capturing phylogenetic knowledge. To be fair, it is unreasonable to think that any single organization can keep track of all the progress in taxon discovery and phylogenetic inference across the entire tree of life. Sitting in the audience at MSA, I wondered how long it would take for the trees being projected on-screen to be reflected in the taxonomy presented by organizations like GBIF or NCBI (or EoL , CoL, etc). 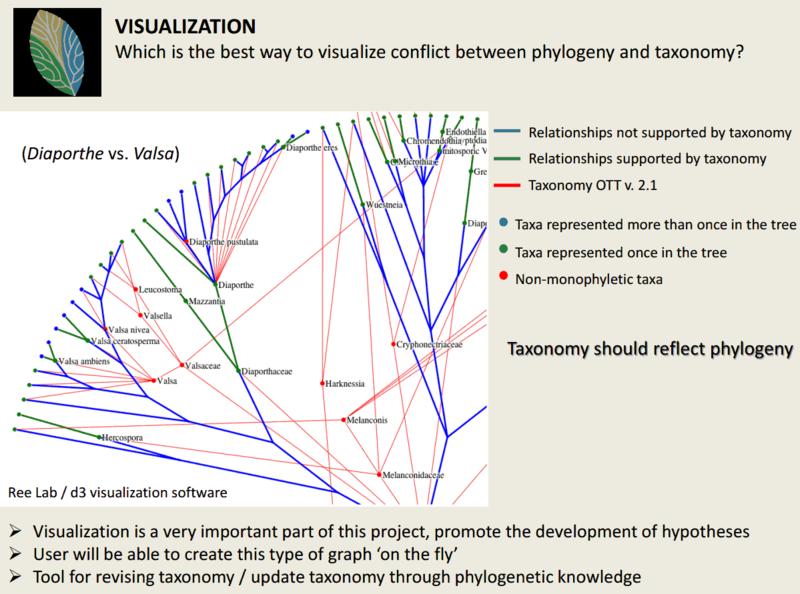 Perhaps a new, community-based approach is needed for building a taxonomic commons? For the .pdf file of Open Tree of Life’s Challenges and Progress for Fungi, check out Mycological Society of America 2013. Dr. David Hibbett is a professor of Biology at Clark University. This entry was posted on August 26, 2013 by cmongeau. It was filed under Building Open Tree .